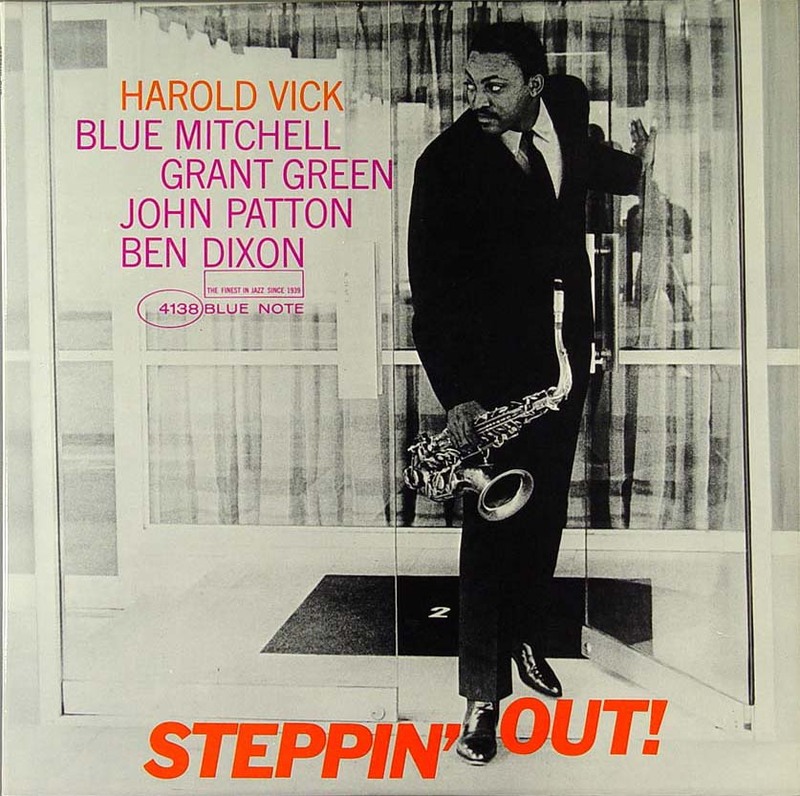 I hear a lot of Dexter Gordon in tenorist Harold Vick: a similar way of blowing forcefully, of bending notes and freewheeling easily between the lower and middle register. Beside the Dex comparison, there’s the blues, the core of Vick’s style. It’s the prime reason why Vick blended so well with organist Jack McDuff, whose group he was a part of during the recording of Steppin’ Out!. Steppin’ Out!, indeed, sounds very much like the output of his boss from that period: an r&b and gospel-tinged repertoire and a beguiling atmosphere close to that of a live club date. The musicians in question benefit from being acquainted to one another. Vick knew Grant Green from the guitarist’s stints with McDuff. Moreover, at the start of their professional careers, Vick, organist John Patton and drummer Ben Dixon played in r&b-singer Lloyd Price’s band and later on joined forces (along with Grant Green) for John Patton’s album Along Came John in the spring of 1963, recorded a mere six weeks before Steppin’ Out!. Finally, about that time Patton, Green and Dixon were becoming a remarkably tight soul jazz team, recording together on Lou Donaldson’ The Natural Soul and Good Gracious, Don Wilkerson’s Shoutin’ and Grant Green’s Am I Blue. Drummer Ben Dixon deserves special mention. Dixon spurs his colleagues on, displaying flamboyant press rolls and ‘crash cymbalism’, accentuating the blues-based changes meticulously. Dixon’s share in the album’s succes is immediately apparent once the opening track, Our Miss Brooks, has been kicked off. It’s a Vick original that was also in the book of McDuff’s group and as such recorded as opening statement on Somethin’ Slick. Even if Dixon’s style is tough, it’s more polished and less in possession of a rock&roll edge as that of Joe Dukes, his fellow drummer, who was in McDuff’s group at that time. It’s easy to understand why Our Miss Brooks was a McDuff favourite. It’s a delicious, medium-tempo blues, containing the kind of changes that give you the feeling they’re exactly where they supposed to be. The group performs it with apparent joy. The soloists, Green, Patton and Vick, inject into their tales an extra bit of energy. Vick’s part is a down-home treat from start to finish. Besides showing unadultered emotion and a charming nonchalance that instead of being confused with lack of technique signifies maturity, Harold Vick also proofs to be a writer of compelling soul jazz tunes. Trimmed In Blue is a McDuff-style cooker including a standout Patton solo; Dotty’s Dream contains a carefully crafted tale by premier hard bop trumpet player Blue Mitchell and Steppin’ Out! is a joyful shuffle that more or less functions like one of those typical live ‘farewell’ tunes usually called The Theme and such. You’d expect to hear Vick incite applause from the audience by introducing the musicians on the bandstand any minute. However, Steppin’ Out! is not a live show but one of the principal organ-sax combo studio releases from the early sixties.